Every mathematician (beginner, amateur, and professional alike) thrills to find simple, elegant solutions to seemingly difficult problems. Such happy resolutions are called ``aha! solutions,\'\' a phrase popularized by mathematics and science writer Martin Gardner. Aha! solutions are surprising, stunning, and scintillating: they reveal the beauty of mathematics. 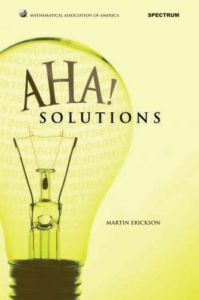 This book is a collection of problems with aha! solutions. The problems are at the level of the college mathematics student, but there should be something of interest for the high school student, the teacher of mathematics, the ``math fan,\'\' and anyone else who loves mathematical challenges. This collection includes one hundred problems in the areas of arithmetic, geometry, algebra, calculus, probability, number theory, and combinatorics. The problems start out easy and generally get more difficult as you progress through the book. A few solutions require the use of a computer. An important feature of the book is the bonus discussion of related mathematics that follows the solution of each problem. This material is there to entertain and inform you or point you to new questions. If you don\'t remember a mathematical definition or concept, there is a Toolkit in the back of the book that will help.